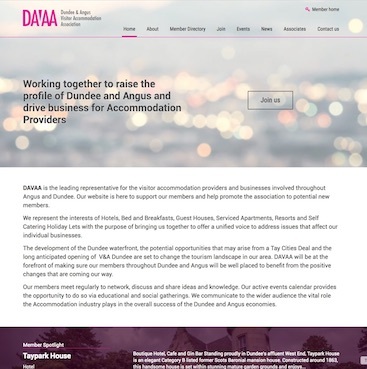 The Dundee and Angus Visitor Accommodation Association (DAVAA) was formed in late 2016 with the intention of promoting collaboration and cooperation among hotels, guesthouses and B&Bs in Dundee and Angus. Dundee city centre area is undergoing a huge transformation and is steadily becoming more attractive to both leisure and business visitors. DAVAA required a logo, branding ideas and a website for members. After some initial discussions we created a number of mockup designs that presented alternative branding and site designs. The decision to go with the bold pink logo was (thankfully) unanimous! The website was to be the primary means of communicating with DAVAAs members and it was important that both upcoming events and DAVAA news could be easily maintained. To facilitate communication between members and also to act a showcase for the diverse membership across the region, a member directory was created. 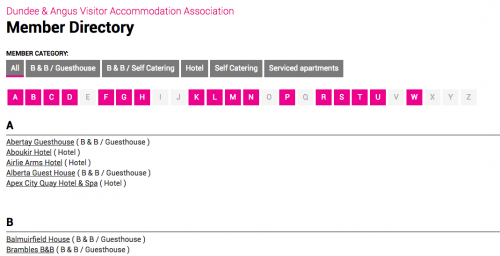 The directory enables DAVAA administrative staff to add and update member details including images, text and a location (shown on a Google Map) associated with each member. Most of the communication DAVAA has with its members is public, but there are a few documents that are intended for members eyes only so a secure area was included that requires a username and password to access. Additionally the entire site was set to use SSL by default. Once the logo and branding was finalised, we designed and printed a number of business cards and rollup banners (small & large). The DAVAA team used this to present a unified image when presenting the website, or attending trade shows in a effort to recruit new members.